Psoriasis is a chronic immune-mediated disease that appears on the skin. It is a skin disease red, scaly and thickened. The disease usually affects people between the age of 15-35 years. Kim Kardashian, one of the artists is shocked to hear of her illness. 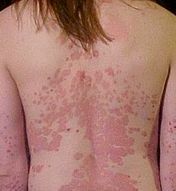 Symptoms of psoriasis is the emergence of red blotches on the top there is a thick white scales and stick in layers. As a result, the skin suffering from psoriasis have a firm boundary with normal skin. Psoriasis can be treated with topical treatment when the disease still in the mild stage. When the disease has reached the stage of moderate to severe (skin affected by psoriasis area above 5%) can be done phototherapy or photochemotherapy. However, until now there is no medicine that can cure psoriasis totally. Therefore, when treatment is stopped, usually the disease will recur again and should be followed by maintenance treatment.